Heat pumps are now a realistic option for any home, in any climate. 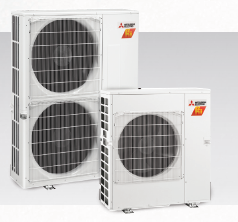 The MXZ H2i® family of Hyper-Heating INVERERTM residential systems offer year-round, high-efficiency heating and cooling for a variety of indoor units provide zon comfort control while the INVERTER-driven compressor and electric LEV's in the outdoor units provide closer control and higher efficiency with minimal power usage. 19.1 - 17.0 SEER, 11.3 - 9.8 HSPF, INVERTER-driven compressor. Quiet outdoor unit operation as low as 49 dB (A). Prevents ice buildup in extreme environments. New sleek design offers many new features including new multi-functional wireless remote controller. Triple-action filtration including anti-allergen enzyme filter. i-see SensorTM 3D senses human heat signatures. Ceiling-recessed indoor units offer a wide airflow pattern for better air distribution in a less obtrusive style. Offers a 2, 3, or 4 way airflow pattern. Built-in condensate lift mechanism (up to 20"). Floor-mounted indoor units are perfect for difficult areas that may be smaller or don't have usable wall space. Wireless remote control with smart set feature. Front panel filter access for ease of cleaning.